The next census of Bermuda is not scheduled to take place until 2020. However, recent population figures are available from a variety of other reports. One of the most recent is the Bermuda Digest of Statistics 2014, produced by the Government of Bermuda, Department of statistics and issued in January 2015. The population of Bermuda in 2013 was 65,091. In 2013 there were 648 births and 471 deaths. In 2013 there were 471 marriages and 165 divorces. The most recent census of Bermuda was carried out in 2010. The data in this article is taken from the 2010 Census of Population and Housing report, published in 2012 (final results) by the Government of Bermuda, Department of Statistics. The report revealed that the civilian non-institutional population of Bermuda in 2010 was 64,237. This compares to 62,059 recorded at the previous census in 2000, a modest increase of 3.5 per cent. There were 30,858 males and 33,379 females. Blacks comprised 54 per cent of the population and were the largest racial group, a slight decrease from 2000. Whites were the second largest racial group, making up 31 per cent of the population. The proportion of persons reporting Asian or ‘Other’ as their racial group doubled from 2 per cent in 2000 to 4 per cent in 2010. This is accounted for by the influx of Asian and other foreign workers during the intercensal period. The total land area of Bermuda is 20.74 square miles and in 2010 the population density was 3,097 persons per square mile. This was a slight increase over the 2,992 persons per square mile recorded in 2000. This makes Bermuda one of the most densely populated countries in the world, ranking behind just a handful of countries such as Monaco, Singapore, Bahrain, and Malta. In 2010 Pembroke, which includes the capital Hamilton, was the most populated and densely populated parish in Bermuda. This was despite a drop in population of 6.2 per cent. St George’s is the least densely populated area of the island. Much of its land is occupied by by LF Wade International Airport. The rich enclave of Tucker’s Town and several golf courses are also here. It did however see population growth of 17.8 per cent. Construction of residential properties in the intercensal period was a major factor driving the relocation of residents between parishes. 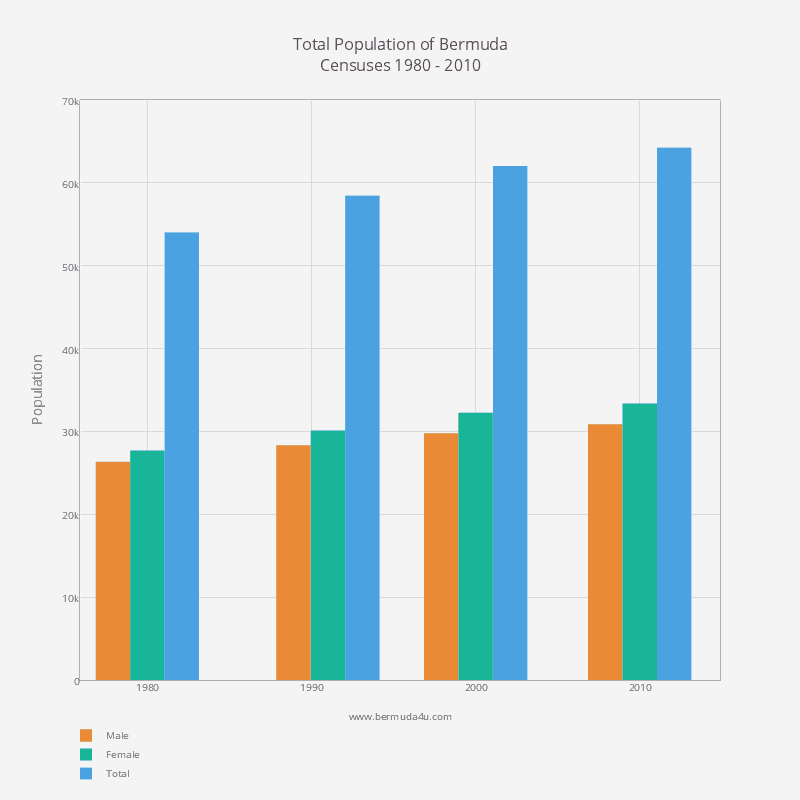 Although the total population of Bermuda grew modestly in the 10 years to 2010, there were significant changes in age groups. The proportion of residents aged between 45 and 64 increased from 24 per cent in 2000 to 30 per cent in 2010. This can be attributed to the rise in births in the Baby Boom period after World War II. The proportion of seniors also rose significantly. The most recent projections indicate that the proportion of seniors is expected to rise to 22 per cent by 2030 and the numbers of children continue to fall. Although the number of persons claiming no religious affiliation increased between 2000 and 2010, Bermuda remains a deeply religious society. 50 per cent of households reported an annual income of more than £108,000 in 2010. 35 per cent received more than $144,000. The median household income in 2010 was $106,389, a staggering 48 per cent rise on the 2000 figure of $71,662. For more information about salaries and income see our guide to the economy of Bermuda. In the intercensal period the numbers of dwellings occupied by owners rose while the number of rented dwellings fell. The median monthly rent paid in 2010 was $1,700; while the median monthly mortgage/loan payment was $3,500. The unemployment rate jumped from 2.6 per cent in 2000 to 6.5 per cent in 2010. Although Bermuda has a strong economy, it did not escape the effects of the global financial crisis. Tourism suffered greatly, forcing many hotels to close during the intercensal period. 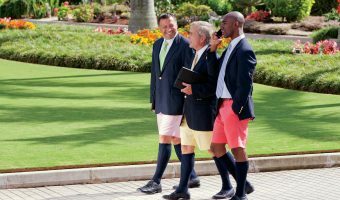 Just returned from Bermuda. Clean island and people generally very helpful and friendly. Easy to find good food (ask the cab drivers). Bus service is plentiful and punctual. You’d never know you had left home. The pace is very similar to U.S. ( vacation mode is encouraged, though). Every effort is made to ensure tourists enjoy their leisure. Any plans to make the raw census data available for members of the public like most other countries? I wish they would. Inputting the data manually is a real pain. The most recent population in Bermuda is 68,946. Some of the Portuguese worked very hard for many years and have risen to positions of high standing in the community and sporting world. Many of the Portuguese played cricket and soccer in the 1940s and 50s and were the founders of many sporting clubs and teams. There’s also a small number of persons of Native American Indian descent on St David’s Island. The Portugese came mainly from the Azores. They originally came to Bermuda as gardeners and farmers. Many still work in these trades, but today you’ll find them in all professions.